Lantek MES Manager is designed for companies interested in a complete and competitive solution capable of enhancing its manufacturing processes and integration with CAD/CAM solutions. 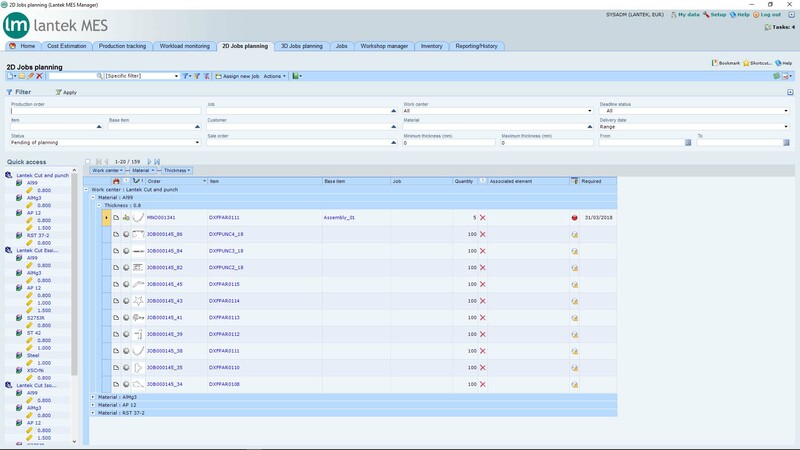 Imagine being able to know, in real time, the status of each one of the parts or/and customer manufacturing orders. Imagine being able to have an optimized view considering different key variables in the workshop: delivery date, customer, sales order, machine, material and thickness, among other things. For monitoring of a manufacturing order, the system has advanced functions for grouping the parts according to different criteria, such as: machine, material, thickness, delivery date, sales order, customer, etc. 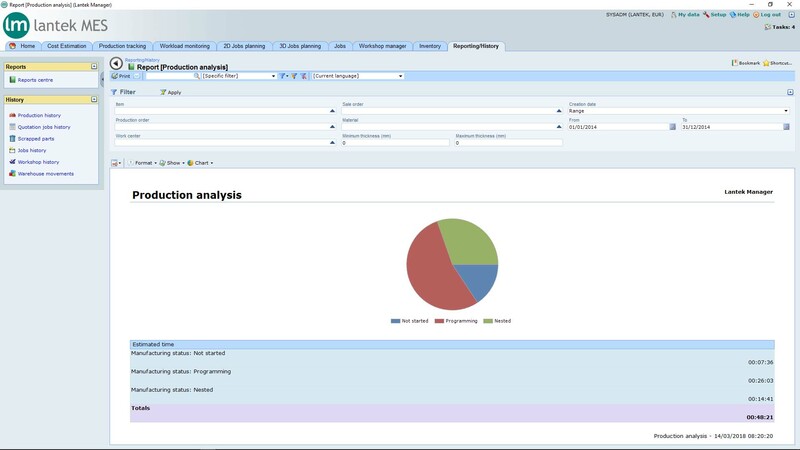 The user can check, in real time, the status of the manufacturing product and discover whether it is: stand-by, nesting, under production or finished. All statuses are graphical and managed intuitively. Through different graphic indicators, it is possible to view the manufacturing evolution. Considering the machine load, it is possible to optimize the launching of orders and the generation of CAD/CAM jobs. The system takes into account different types of manufacturing requirements either planned from the management solution, or imported from geometry like DWG, DXF files, etc. Lantek Manager has the ability to monitor the volume of work, to manage completed operations, and to optimize resources, such as employees, machines, and sub-contracting centers. From the office, it is possible to reserve materials for a specific job or to give priority to other jobs. 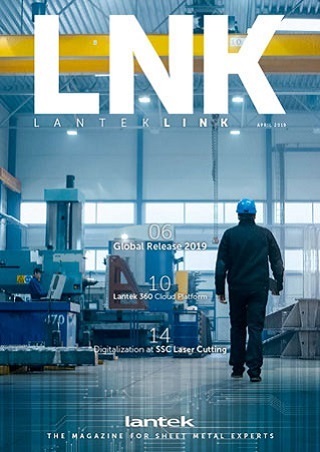 Lantek Manager connects with third party workshop data solutions and allows the logging of times and real material consumption for each nest and production process. Lantek Manager performs a comparison between estimated costs and true costs for selected manufacturing orders. It also allows specific evaluation of those orders and their associated products. Customers can enter and continuously update costs data, as well as capture industry costs from the web. 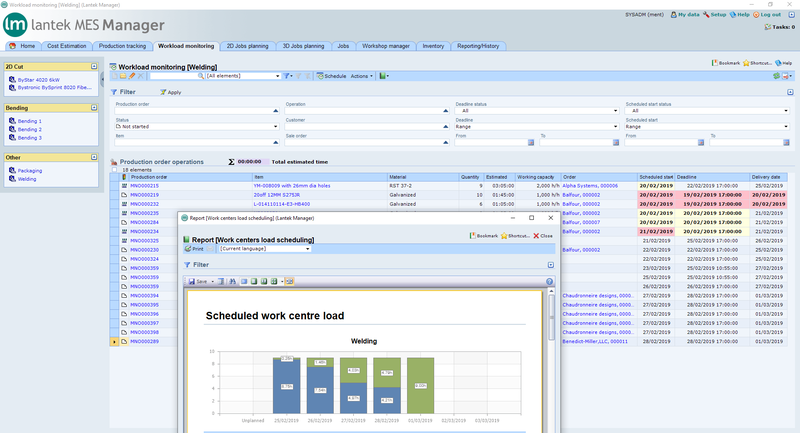 Lantek Manager provides powerful business analytics tools which arm managers with the information they need to continually improve production times and methods. These tools cover manufacturing orders, incurred costs, volume of work, change orders, etc. 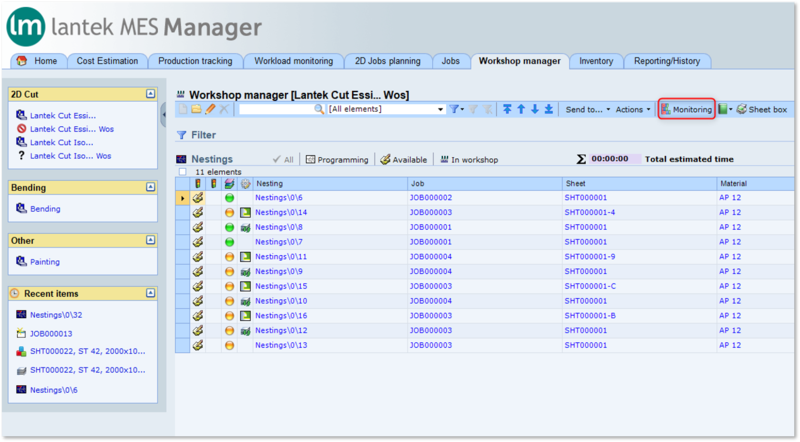 Lantek Manager provides manufacturers with technology tables that they populate based on machines and their features. It also contains an advanced sales manufacturing history record management. Sheet metal MES software (Manufacturing Execution System) that directs the execution of all manufacturing processes in the workshop.